This book was amazing! START WITH WHY blew my mind. Well, it has pretty much changed my perspective on why I do things. Mainly why I’m starting my own business, but also why I spend time reading or watching my favorite program. From now on even the littlest things can START WITH WHY in my life! The concept is fairly simple yet has so much power. Simon Sinek did a thorough job of explaining the importance of WHY and how it can help put your business ahead of others. It’s not all about being a leader in business though, it’s also about building a connection between you, and your following. The clarity of WHY shines brighter and longer than any HOW or WHAT. The examples of how Apple has dominated technology are because of WHY the company is in business. What makes Apple stand out? It’s not WHAT Apple makes, or HOW they make it. The reason why they have such a loyal following is because they start with WHY they make their products. Apple is used as the main example throughout this book because of how powerful their purpose is. Powerful Lesson #1: It’s not what you make or how you make your product that matters the most. It’s the whole reason behind your product. It’s why you make it that makes people want to buy it. One of the concepts of the book which I never really thought about before was the fact that feelings are hard to express because they come from the part of the brain (limbic brain) that doesn’t deal with language. That’s why it’s so hard sometimes to explain why we love someone. NOTE: Simon Sinek mentions that he did an extensive study on this subject but doesn’t go into the details of the study in this book. That’s not what the message of this book is, thank God, but it is nice to know that there was a study behind Sinek’s Golden Circle which I will briefly introduce in the next section of this post. The limbic brain is very powerful and is able to influence the type of behaviors that we have. Using WHY first in anything you do will connect much better to your feelings than if you use WHAT, which better connects to the neocortex. Powerful Lesson #2: Feelings can only be expressed through your WHY. When customers have a deep down connection to why you do something is when you’ve won a loyal customer. The Golden Circle is actually a very easily explainable concept, but hard for some to apply. The concept simply explained, is to start with WHY, then move to HOW, and last should always be WHAT. 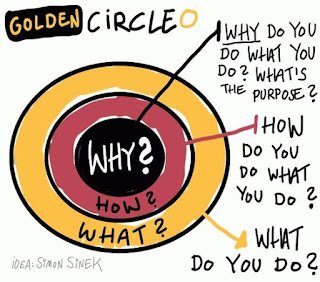 The reason why The Golden Circle works so well is that when companies follow this rule, the customers can easily relate and feel the WHY of the company. When customers understand the WHY of your company, they will become loyal followers because of what you stand for. Trust is huge when it comes to having both loyal customers and employees. We all know what it feels like to distrust someone and this is not a good feeling at all. We also all know what it feels like to trust someone with our life. And that feels indescribable. Consider the story of two stonemasons. You walk up to the first stonemason and ask,”Do you like your job?” He looks up at you and replies, “I’ve been building this wall for as long as I can remember. The work is monotonous. I work in the scorching hot sun all day. The stones are heavy and lifting them day after day can be backbreaking. I’m not even sure if this project will be completed in my lifetime. But it’s a job. It pays the bills.” You thank him for his time and walk on. Can you spot the difference between the two? The first one seems bitter and considers this as just a JOB. The second one, however, sees a purpose in what he’s doing, and even some of the things he says are the same as the first one, but his attitude toward the whole ‘work’ is positive. He knows exactly why he’s there. He’s building a cathedral. He feels like he belongs. He starts with why. Companies that build a sense of WHY in their offices or construction sites will empower their employees to think and work together. The employees won’t just be co-workers with each other, they will be a family. That goes for the customers too. Customers are keen on picking up the vibe when they come into an office, store, or even over the phone with a customer service representative. If the company has a strong WHY the employees will be happy and follow through with the purpose of the company and in turn, the customer will catch on to that as well and become a loyal customer for as long as the company holds true to its WHY. As I discussed in my review of ‘The Tipping Point’ by Malcolm Gladwell, everything in life either comes to a tipping point and spreads like wildfire or doesn’t. In START WITH WHY Sinek goes further to explain about Innovators (2.5% of consumers), Early Adopters (13.5% of consumers), Early Majority (34% of consumers), Late Majority (34% of consumers), and Laggards (16% of consumers), and explains that you NEED the first two groups to adopt your product in order to reach the tipping point into the Early Majority, and Late Majority. Story: Back in high school I used to work at Blockbuster, a video store that doesn’t exist anymore. I can clearly remember when I first started working there, the stock of VHS and DVDs were about half and half. As the years went along the stock of VHS dwindled and the DVDs increased. A few older customers would come in and comment when they brought their VHS up to the counter, ‘Your selection is getting worse!’. Another year or two later Blockbuster discontinued stocking VHS and lost most of their older customers that held onto their old technology (The Laggards). Years after I stopped working there to finish my degree and move to Indonesia, Blockbuster went bankrupt and closed its doors. Maybe it’s because they lost their WHY. NOTE: The Laggards don’t really matter since those are the type of people that don’t adopt a new product until it’s not new anymore. They adopt the ‘new product’ when it’s too late. Taking for example, like in my story above, VHS to DVD. The Laggards held hold onto VHS technology until ALL the stores did not sell them anymore. So in reality Laggards don’t matter. Once you break that 15-18 percent you’ll reach a tipping point and your idea or product will make its way through the bulk of consumers, the Early Majority (34% of consumers), Late Majority (34% of consumers), and eventually the Laggards (16% of consumers). Imagine the Golden Circle as a cone rather than a circle. Up at the top, you have your WHY people/person which is the CEO or founder. Then you have the HOW people who are usually the senior executives who are inspired by the CEO’s vision and know HOW to get the vision out to the public. Lastly are the WHAT people who are the managers and employees who accomplish the results of the WHY and HOW. If any of the links are missing, the company cannot succeed. Now can you imagine that Golden Circle cone being a megaphone? The megaphone will help the clarity of the WHY of the company to reach all the way to its customers. When a company is small it’s not too hard for the CEO to spread his WHY because he’s at the forefront of the company and the customers. But as the company grows, the megaphone needs to grow as well since the CEO sees less and less of his customers and employees, therefore, he needs to personify the WHY. He needs to live it, breathe it and let his WHY flow straight down the neck of the megaphone, through the executives, managers, and employees all the way out to the customers all while never losing the WHY. Dr. Martin Luther King Jr. was also another example Sinek used a lot throughout this book along with the Wright Brothers, Southwest Airlines, Harley-Davidson and Disney (actually there are more but these are the ones I thought stood out, other than Apple of course). But at this time I want to use an example from the book about why using the Golden Circle cone’s megaphone is essential in getting your message’s clarity all the way down to the customers then we’ll transition directly into why WHY people need HOW people. In 1963, as we know, Dr. Martin Luther King Jr. got in front of 250,000 people to make his ‘I Have a Dream’ speech. What he did that day was implant the idea in people’s minds about rights and justice for everyone. But he didn’t do it alone. Just like any great leader, there’s usually another great person or people behind them helping to implement the leader’s WHY and translating it into a HOW and WHAT. King’s HOW guy was long-time friend Abernathy who spoke after King’s speech to tell the people ‘what that meant for tomorrow morning.’ He told people ‘Don’t ride those buses.’ and so on. Without Abernathy’s HOW, King’s WHY would have stayed just a dream. Powerful Lesson #3: Make a plan of action including all your WHYs, HOWs, and WHATs in that order. Be your WHY, and if you don’t know how to get your WHY out to the public then find your HOW person to help bring your WHY to life. As we can see from King’s example previously, it’s clear that people who start with WHY (people with the vision) need HOW people (people that know how to take that vision and implement it into a structure and product) in order to make their vision into a reality. Here’s another example about Walt Disney and his older brother Roy Disney. Walt was a WHY guy always dreaming the big picture for the future but sometimes forgetting about things in the now. Roy was a HOW guy who worked at a bank. It seemed like he always kept Walt’s finances on track and eventually he ran the Disney business from the background creating the Buena Vista Distribution Company that made the Disney films and the merchandising business as well. If it weren’t for Roy’s HOW, Walt’s WHY would have never turned out the same way it has today for Disney, or maybe there would have never been a Disney at all. START WITH WHY goes on to explain that most people in the world are HOW people. It’s rare to find many WHY people. This is what I personally think. Many of the WHY people are hidden either because they haven’t educated themselves enough to develop their own ideas into a clear vision and that’s not necessarily their fault. I was actually one of those people until recently. When I was growing up, I was never educated in how to handle a business or finances, all I really wanted to do was play games and play in orchestra and band. I was so engulfed in my own world that I never really stopped to think about the difference I could make in the world until recently. And then there are the WHY people that have a clear vision and have educated themselves but just have not found the right HOW people, or maybe they’re stuck in a dead-end job. It’s terrible to think of it that way but it’s reality. It IS a reality we all can change! I also believe that many WHY people have mistaken themselves as HOW people. Here’s a quote from the book. Powerful Lesson #4: So what should you do about that if you think you’re a WHY person? Build your networks. Find people who completely support your WHY. Even better, find a HOW person to support your WHY. That HOW person will know exactly what to do to help bring your WHY to life. Make at least one or two new connections every month if not more. Bulid, build, build. Build a team of committed people you can trust. After reading START WITH WHY I realized there is no other way to live my life except for by the way of my WHY which is to ‘spread the importance of gaining knowledge through reading so that you can empower yourself to make impactful changes in your world‘. Throughout this review, I did my best to pick out all of the parts of the book that I thought was most meaningful. TRULY there are so many other great tidbits of wealthy knowledge here and there throughout this book, too much to mention here. But even though I’ve given you a thorough analysis, I strongly recommend this book. Borrow it from a friend or buy a copy. If you’d like to know exactly how to create your own WHY, Simon Sinek recently wrote FIND YOUR WHY (my review), the companion workbook, published in 2017. Don’t forget to subscribe to all upcoming posts and personalized updates, and share this post with everyone you think needs some inspiration and direction in their lives. I’m just learning and spreading what I learn from the experts. In the process I’m becoming an expert myself. The key to success is knowledge and action. I hope your journey is a success as well.